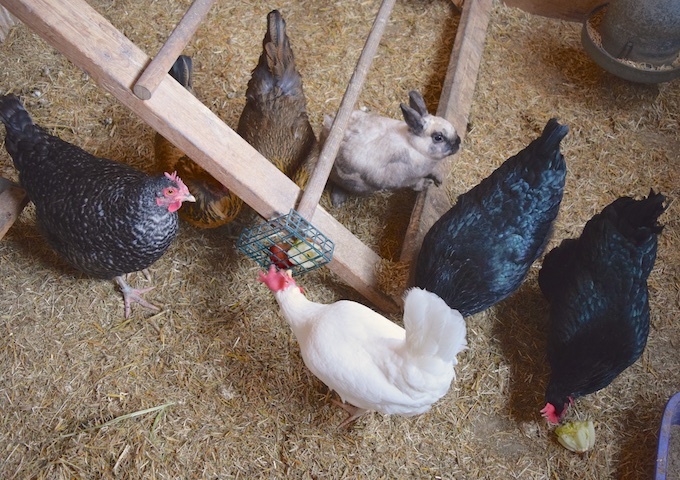 Can I Keep Rabbits and Chickens Together? Almost two decades ago I was given a rabbit hutch. Free! 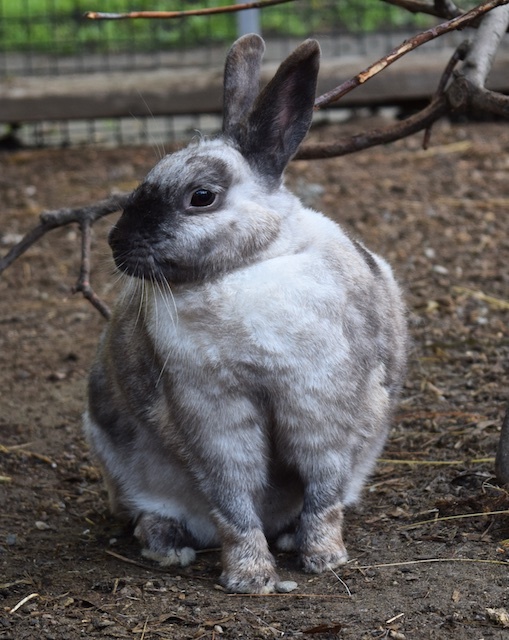 And so I got a rabbit – how much could a bunny cost? It turns out, a lot. I fell in love with a huge blue roan rabbit at the animal shelter, named him Cinder, and brought him home. He was too big for the hutch, and so I purchased a new hutch, various bottles, feed, etc, and had Cinder neutered. That “free” rabbit cost several hundred dollars. Cinder was an indoor bunny. They’re easy to litter box train, and he had a charming personality. Rabbits do shed and chew, but Cinder was worth the trouble. After Cinder passed, we got Spot, and then Candy, a lop-eared female, who was quite sociable and loved my son, who’s room she stayed in. I tried to deny it, but I was allergic to the fur. It was finally decided to put Candy outside with the chickens. Many people are adamant that pet rabbits should be kept indoors. I agree that it is a terrible life for a rabbit to be isolated outside in a hutch. However, that’s not what I do. I’m not a rabbit expert, I keep only one at a time, and Phoebe, the current resident, is only my fourth. But, how I keep a rabbit in with my flock has been successful, and I’ve heard from many who have modeled their animals’ care after what I do, and that they’ve had happy, healthy and joyful situations as well. So, I’ll tell you here how I keep a bunny in with my hens. I wouldn’t do this if it weren’t in my rabbit’s best interest. From what I’ve observed, a rabbit will adopt a flock as her own. Candy enjoyed the company of hens, (she would seek them out and park herself in their midst) as does Phoebe, seen here with her flock. Phoebe in with the hens. 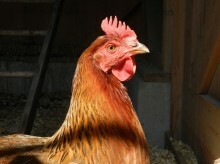 Phoebe is mild-mannered, but Candy would tease the hens. Numerous times, I saw her gallop through a group of dust-bathing hens, just for the thrill of making them scatter. 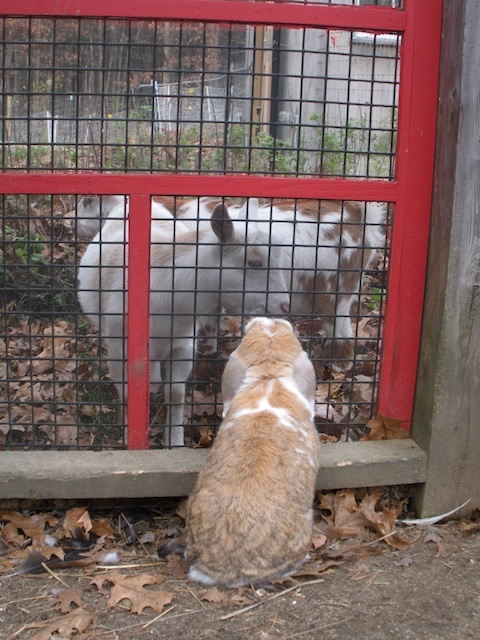 Candy talks to Pip, the goat. and something interesting going on all of the time. It was fascinating to watch Candy’s transition from indoor to outdoor bunny. Although she was attached to my son, she clearly blossomed outdoors. It was heartening to watch her interact with other species, and to be able to do bunny activities, like digging snow tunnels. My rabbits respond to the weather. I’ve seen them get gleeful, kicking up their heels when the cool spring breezes blow, and luxuriating in a sunny patch during a cold spell. An outdoor rabbit has much to sniff, and can have a long hop-around as night falls (their favorite time of day.) It was obvious that Candy loved being outdoors. My vet (who has a side-specialty in rabbits) told me that Candy was the happiest and healthiest rabbit he’d ever known. But, I wouldn’t toss a rabbit into any coop. My chicken pens are kept clean. The pen is kept raked to keep manure to a minimum. The coop is skipped out frequently. I wouldn’t keep an outdoor rabbit in a muddy, dank, or manure-laden pen. Also, a rabbit is not a chicken, and she requires her own food and hay, and a place for her to retreat to, separate from the hens. 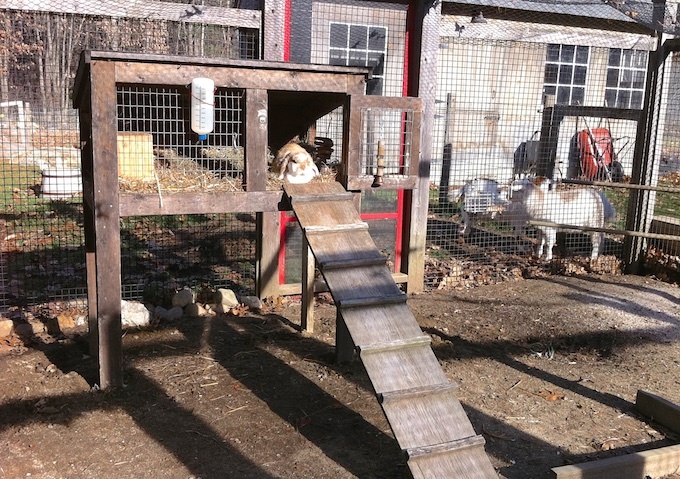 Candy had her own hutch, which she did not allow the hens in. She was quite the Empress. After 9 very good years, Candy passed on and I got Phoebe. Bunnies can be quite opinionated. Phoebe insisted that she didn’t want to sleep in the hutch, that she’d rather be in the coop with the hens, so I created a cozy nook under the nesting boxes for Phoebe that only she can fit in. What’s important is that in both of these set-ups, the rabbits have had an inside place to stay safe from predators at night. Each of my rabbits were taught to come inside at dusk (a banana chip does the trick) so that I can latch the door to keep out raccoons and other animals. I have other predator protection as well. Because rabbits burrow, the fence is dug 8 inches down, so she can’t get out and predators can’t get in. There’s hawk netting above. When the chickens are allowed out to free-range, I close the rabbit up in either the coop or the hutch. Unlike the hens, my rabbits have not been trained to come when called. Besides, it would take just one loose neighborhood dog to lose the bunny. It’s just not worth the risk. I provide hay, rabbit pellets and water. Phoebe, who sleeps in the coop, uses the chickens’ water dispenser. In the winter, it’s heated, and she appreciates that. A rabbit might eat from the chicken feeder; mine have. That doesn’t worry me too much, as the bulk of her diet comes from her own pellets, as well as fresh vegetables, and in season, handfuls of clover and parsley. Because rabbits love to chew, I provide apple branches, and other sticks. If you do have electrical wiring, try to keep it out of reach of the rabbit, and definitely protect it with conduit. 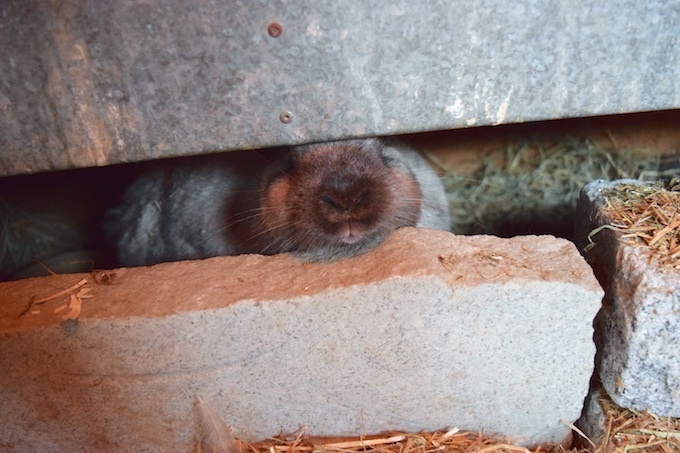 One other caveat – rabbits love to gnaw on foam insulation. If you have it, cover it with plywood. 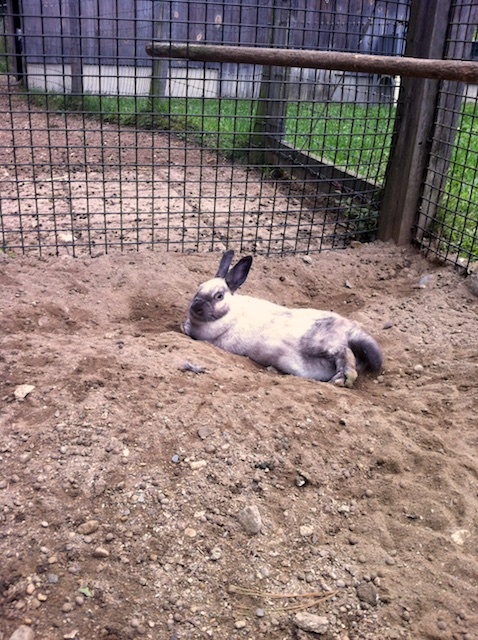 An outdoor rabbit gets lots of exercise, and will dig and scratch. I haven’t had to trim my bunnies’ nails, because they wear down naturally. Candy did had sensitive lop-ears, which I would put ointment on when they became dry and sunburned. If you have an indoor rabbit that you want to move to outside quarters, you need to wait for the appropriate season. You can’t put an indoor rabbit out in the winter – they haven’t grown their thick, warm coat. Conversely, rabbits get heat stroke, so a bunny used to air conditioning should not be suddenly asked to live outside. Spring and fall are better times to introduce a rabbit to the outdoors. I always keep a close eye on the temperature. Rabbits do just fine in very cold weather. My current rabbit, Phoebe, has no issues at all with staying warm. However, Candy was a lop-ear, she couldn’t pin her ears to her sides to keep them warm, nor put them upright to cool off. Long ears that drag on the ground will get frostbit, muddy, and infected. An especially long-earred rabbit is not a good choice for an outdoor bunny. On the other end of the weather spectrum, rabbits suffer from heat stroke. So, think carefully about where to put the hutch. In the winter, Candy’s house was positioned in the sun, and in the summer a shade tarp was installed overhead. It is not a big production to introduce a rabbit to the flock. Keep her in her hutch for a week, where she can watch the hens, and they can see her. Then, close the chickens in the coop and let your rabbit out to explore the fenced yard. Have her practice going up and down the ramp. Then let out the chickens. They might be a tad surprised! But, soon, everyone should mingle happily. If there is plenty of space, this should all go smoothly. Candy was a neutered female rabbit. I’ve heard about intact males that try to mate with the hens. I recommend neutering for many reasons, including improved health and calmer behavior. I would not keep breeding rabbits and tiny babies in with the chickens. Having a rabbit in with the hens adds to the fun of chicken keeping. I love observing the interspecies interactions, and a rabbit galloping around the pen is a joy to watch. I can’t guarantee that you’ll have the same experience I’ve had, but it’s worth a try!